By Bates of Jermyn Street, London. Large size - approximately 7 (physically measures 57cm). 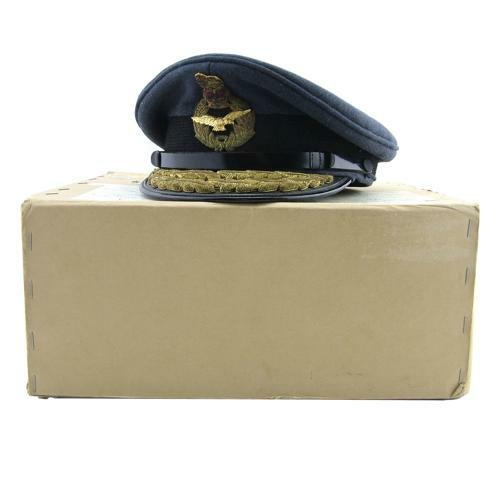 An 'Air Rank' service dress peaked cap dating from the mid 1970s. This is in excellent clean and moth free condition. Very nice Queen's crown bullion badge and peak with distinctive double row of heavy bullion leaves. Lined in green felt with a greasepaper protection sheet. The maker's crest/details are visible beneath the greasepaper. The inner leather band is good and has the original owner's name marked on the innerside. This belonged to Air Commodore Geoffrey John Barnes Claridge CBE, OBE. He was born on 23rd February 1930 and completed flying training in 1951. He was posted to 151 fighter squadron based at Leuchars followed by a tour at the Central Fighter Establishment before leaving for Canada where he served for 2 years as an instructor with the RCAF in Winnipeg. Back in the UK he went to HQ bomber command before attending the RAF staff college at Bracknell in 1963. This was followed by a tour with No.31 photo reconnaissance squadron at Laarbruch in Germany. On his return he was posted to the MOD but in 1969 moved to the Air Secretary's Dept. following promotion to Wing Commander. In 1971 he was appointed CO of 51 Squadron after which he was awarded an OBE. He completed an air warfare course and returned to the MOD before becoming senior RAF officer Northern Ireland and Station Commander at Aldergrove on promotion to Group Captain in 1975. In 1977 he was awarded the CBE, attended the senior officers warfare course at Greenwich and went to Supreme Headquarters Allied Powers Europe (SHAPE) in Belgium as a special assistant to the Supreme Allied Commander, Europe. A year later he was promoted to Air Commodore and became the United Kingdon National Military Representative at SHAPE, a post he held until May 1981. After this he returned to the UK as director of RAF recruiting. Claridge retired on 11 June 1984 and died on 1st January 2012. A rare cap complete with original card box. We also have Claridge's field service cap and Air Commodore tunic/trousers available. Stock code U23347.